All of our candles are hand poured and earth friendly. We use 100% pure soy wax because they do not emit the soot and have a much lower melting point compared to paraffin wax. Therefore, our soy candles burn slower and last between 30 to 50 % longer than paraffin wax candles. 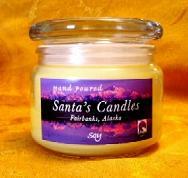 Santa's Candles also contain no lead in the wicks and are triple scented. The scent will go all way to the bottom and burn evenly. We carry over 120 different scents so far and we are going to expand our scents much much more. 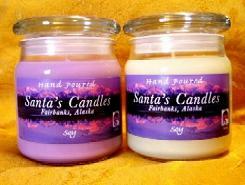 We can also customize any candle scent and color you like. There are four different sizes which are 4oz, 10oz, 16oz and 24oz. 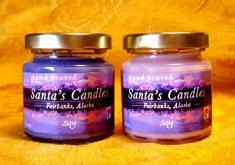 Our candles are also designed to be used on warmers as well as lighting or just take the lid off. By using candle warmers, you will be able to double the life of our candles. If you would like to know more about our candles feel free to contact us or if you do not see your favorite scent on the scents page, please contact us by e-mail. We will do our best to make the scent you would like to have. We guarantee the fragrance will go all the way to the bottom and we know that you will love our candles.